Blue Screen of Death group in Networking in young apprentices category; Team AOS in E-commerce in enterprises category; Team Reboot in Milk Game category; Sust-Hexacore in Parental care category; Codex Unicorn in School monitoring tool category; BUET_COLD_STEEL in Water-logging in Dhaka city category; Buet_firefighters in Fire response category; and The Roar in Gender awareness category. Distinguished guests presented the awards to the winners at a programme at BRAC Centre. Mustafa Jabbar, president, Bangladesh Association of Software and Information Services (BASIS), KAM Morshed, director, Advocacy for Social Change, ICT and Partnership Strengthening, BRAC, Debashish Saha, director, field operations, Plan International, Bangladesh, Sabina Faiz Rashid, dean and professor, James P Grant School of Public Health, BRAC University, were present, among others, at the ceremony. 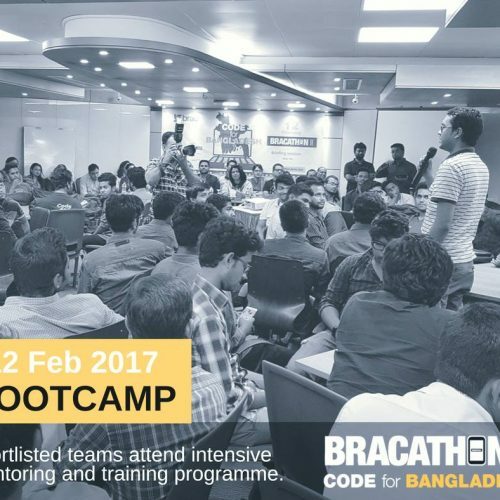 BRAC initiated this competition on January 8 with the slogan ‘Code for Bangladesh’. A total of 40 groups were shortlisted from 200 for taking part in the event. On March 3 and 4, in the final round, 11 groups out of 16 were selected as winners. Every winner group received five thousand US dollars as grants. The organisers said the groups were selected on the basis of the practical effectiveness of their particular apps in solving social problems. BRAC will give assistance to further develop these apps. The BRACathon has also been supported by James P Grant School of Public Health, BRAC University, Plan International, bdnews24.com, BRAC IT Services Limited and BRACNet.